BARR SWEDEN are a new, exclusive brand made from high quality organic ingredients to give your skin the best possible care. They are based in Strömsund in Sweden. Their organic journey started as soon as their founder, Rikard Andersson’s son was born, as new parents, he and his wife realised just how much of their surroundings was based on artificial, man-made substances. They became sceptical about products with long lists of chemical ingredients and wanted to know what they were applying to their skin and, in particular, their son’s skin. They decided to start their own organic brand, BARR SWEDEN, to provide natural, organic products free from mineral oil, parabens, propylene glycol, artificial colouring or silicon. Their products are made according to their own recipes. Specifically chosen to treat skin effectively and with care. They believe that natural ingredients provide the best care for healthy skin. Their products are made in Scandinavia by manufacturers and factories with organic certification and plan to extend the range of exclusive products based on the very best, high quality ingredients. 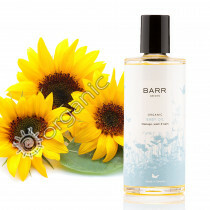 BARR SWEDEN is not tested on animals & contain no animal derivatives.